Usually, books written about the afterlife are popular because the author as a Dr. before his or her name, or is endorsed by the likes of Moore, Ring, Zammit, Moody, or even recently, Alexander. If you recognized all of the names in the previous sentence, you are an afterlife book junkie. Just admit it. Anyway, the author of this book is none of such esteemed ilk. There were no endorsements from spiritual gurus or pioneers of the field, and in his introduction, the author states that none of his family and few friends even know he is writing the book. When I googled the author, I realized he is very young – a millennial – who travels the world and has published books and travelogues instructing people on ‘location independence’, or how to “live the life you want”, without the 9-5 job. Needless to say, I went into this book with a skeptical attitude, wondering what this ‘kid’ could teach me about the afterlife. While most of the facts I already knew from my own research, I really quite enjoyed this book. While I initially thought his lack of age, experience or any scholarly prefix on his name meant that he might not have anything new to add to field, I realized that this is precisely why Cyrus Kirkpatrick’s insight was refreshing. He’s like us. He’s a normal person searching for answers. He’s read all of the same books we have, and he’s had many of the same questions. Unlike other books where the author merely presents the evidence and leaves it up to the reader to interpret the results, Cyrus takes us along his own path of discovery and pull us into his line of reasoning. The result is a new way of thinking about what the evidence really means; and the results is engaging and informative. I was wrong to be so dismissive and I have learned my lesson – Never judge a book by its.. okay. You get it. Cyrus is true to his word; the book is secular in nature and doesn’t pander to many of the more difficult to swallow new-age tenets that some people tend to get trapped in. In fact, I was most satisfied by his logical approach. His admonishment in the last chapters of the book about the problem with the current new-age establishment was particularly awesome, since it seems any book listed on the spiritual shelf that doesn’t subscribe to the ‘love and light’ perspective is taboo. Cyrus cuts cleanly through the dogma and points out the hypocrisy of many new-age believers who profess acceptance and open-mindedness, and yet have such solid stereotypes in their minds about how they think the afterlife works that any disagreement provokes an immediate backlash. Every eye-rolling moment described by Cyrus was something that I could relate to, having suffered much of the ‘love and light’ dogma over the years, especially with the vomit-inducing ‘Abers’ who think they created the law of attraction. Sadly for them, the concept has been around for centuries, and developed to its finest degree by Seth, who I consider a true spiritual messenger, unlike the money grubbing, you-deserve-cancer-because-you-had-a-negative-thought Ester Hicks. I digress. Cyrus carefully examines each line of evidence that we can use to piece together what the afterlife is, similar to the structure of “A Lawyer Presents Evidence for the Afterlife” by Victor and Wendy Zammit, of which Cyrus is an admitted admirer. Among the usual accounts of NDEs and ADCs, Cyrus spends a significant time examining physical mediumship – a topic that I had long ago dismissed – and breathes new life into it. His treatment of the subject was very thorough and is causing me to think differently about what physical mediumship was, and is; as apparently it is still in practice in rare places and only found by word of mouth. He makes a very convincing argument regarding some of the best physical mediums of the Victorian age when Spiritualism was at its height. His study into the Leslie Flint tapes were particularly interesting, and provide some nuggets of info about the afterlife that most new-age and spirituality authors would have passed over because most people (like me) erroneously assume that physical mediumship is passe, fraudulent and not worth serious investigation. I also appreciate that he mentions Wikipedia’s known skeptical bias against this and many other spiritual topics. I am equally grateful that Cyrus is careful to present all of the evidence and to point out both sides of the argument. When he discusses the SCOLE experiments, he not only presents the paranormal evidence, he presents the skeptical arguments as well; how the phenomena may have been forged, though the skeptic’s arguments aren’t very convincing (unless you read Wikipedia, that is). In the middle of the book, Cyrus switches gears and begins his own fascinating story with the paranormal. He tells about his eccentric father, and his interesting upbringing. His story blends nicely with the factual thesis he presents and rounds out the book with a personal touch. Cyrus and his family have some unusual encounters that explain why he has gone on this journey of discovery in the first place, and I found that his personal stories enhanced the book, giving some perspective and dimension to the overall narrative. Cyrus weaves evidence and personal anecdotes together and the result is an easy, enjoyable read. Overall his assumptions about the afterlife are well-thought out and supported by the evidence that he has collected. 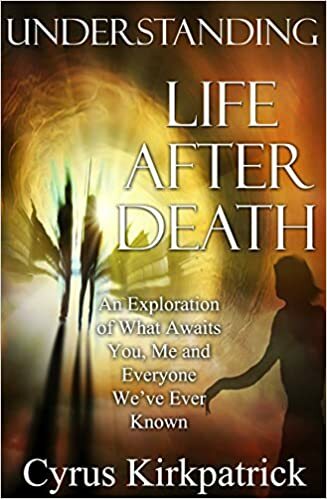 Having recently read “Adventures Beyond the Body” by William Buhlman, I found that both author’s interpretation of the structure of the afterlife were congruent. Many myths about the afterlife are examined, such as the notion that there are levels where one spirit is ‘better’ than another, or that we can suddenly become all knowing in the afterlife. Also busted is the myth that the afterlife is all fairies and poetry and when we get there we become angelic beings of light – something I never believed. Like Cyrus, I believe that the Afterlife is another dimension, something that eventually could be discovered scientifically. It is not a shadowy dream-like world, but a place with its own physics and rules of existence that are different, and in many ways, less restrictive than our own. Buhlman, in his 40 years of out-of-body experiences has come to the determination that the afterlife consists of both consensus realities – those that are created by the thoughts and expectations of many people – and non-consensus or thought-responsive realities, these are realities that are responsive to our individual thoughts. An example of a consensus reality might be the Christian heaven, with its pearly gates and roads made of gold. True believers may go there initially when they die; surrounded by a virtual reality that has been created by the millions of Christians before him and unresponsive to his individual thought in most ways. Once we master these consensus realities or desire to leave them, we can move into other realities where the environment is more malleable to our thoughts, perhaps abandoning form altogether. Cyrus is quick to point out that one is not necessarily better than the other, and that he doesn’t believe the common trope that we are all evolving to eventually merge back into the god consciousness, thus losing our personality and individuality in the process, a la “The Afterlife of Billy Fingers” which somewhat disturbed me for that reason. “Understanding Life After Death” presents a balanced case for why a reasonable person can believe that death is not the end; that consciousness does continue with personality and individuality intact, and why a scientifically-minded person can safely wade into the waters of exploration without fear of catching woo-disease. Where many afterlife writers cannot resist the temptation to insert morality or belief into their examination, Cyrus plainly stays away from this; focusing instead of the physical and environmental aspects of our journey beyond. His hope – as is mine – is that the subject of life after death might one day be treated with the same respect as any other branch of science or philosophy. To achieve that, we must force ourselves to examine it with a skeptical, logical, scientific and secular view. Only then, will mainstream science begin to take consciousness studies more seriously. The book is still on sale at the time of this writing – if you love books on the afterlife, I strongly encourage you to pick this one up. It’s well-written in a conversational style, it’s informative and yet not dry, and it definitely doesn’t drag out any well-worn tropes that we’ve all gotten tired of in every afterlife book that we read. He doesn’t presume anything other than what he’s gleaned from carefully studying the evidence, then lays it out plainly for our examination. It’s a good book and I whole-heartedly recommend it. I’m glad it is now in my collection, and for someone just starting to look beyond the shores of religion into what the afterlife is really like, I might just recommend this book as a starter instead of Zammit’s book; it’s an easier read and much less intimidating for those new to the great puzzle that is the afterlife. My only problem with Cyrus Kirkpatrick’s book is what seems to be his basic assumption that his lucid dreams and OBE’s ARE experiences of the afterlife. They could well be but this is something he and his readers have to “take on faith” I think. I’m not sure I want to. Many of his experiences do sound like what I’ve read of the afterlife elsewhere but who knows? Actual NDEs and medium communications remain the best sources for information on the afterlife, I think. Reading him did lead me to read Jurgen Ziewe’s “Multidimensional Man” which is a truly remarkable book. The process of experiencing the “afterworld” through OBEs/lucid dreaming sounds similar, though I find Ziewe’s accounts somehow more convincing. Next Post Channeling Erik – Miraculous Conduit to the Afterlife or Exploitation of a Mother’s Grief?